An Exchange is a department store on a military base. It provides a full range of quality merchandise and services at uniformly low prices to the military community, regardless of where they are stationed throughout the world. Military exchanges are categorized as joint military activities. They are self-funded and pay operating costs from revenues. Exchanges return earnings to customers through payments to MWR (Morale, Welfare, and Recreation) activities, and investments in new or renovated exchange facilities. Since exchanges receive only a limited amount of taxpayer dollars, they are listed as a non-appropriated (NAF) fund activity; that is they do not rely on taxpayer dollars to exist. The subtle difference is that a different set of laws and regulations govern their internal operations, as compared to GSA contract purchasing. Exchange sales total more than $10 billion annually with over 3000 outlets worldwide, and over 12.3 Million authorized customers. Although there are 3000 individual retail activities, the primary Exchange locations number less than 200, and about 150 total doors comprise the bulk of the retail sales generated. Like civilian retailers, there are various store sizes, depending on the population or location of the military base. Store sizes are typically 50,000-130,000 square feet, although there are some facilities that exceed 300,000 square feet, with escalators, elevators, mall concepts and other features one would expect to find in an upscale civilian retail environment. Shopping in a military exchange requires the end user to be active-duty or retired military personnel, or their dependents, or a current member of the National Guard or Military Reserve. As a result, the military exchange market is considered insular in nature, with no external advertising, and the vendors who sell within this channel consider their derived business revenue to be purely incremental, and not accessible in any other manner. Army/Air Force Exchange Headquarters, located in Dallas, Texas, conducts the buying for AAFES locations worldwide, although they do have liaison offices in Japan, Germany, and Hong Kong. 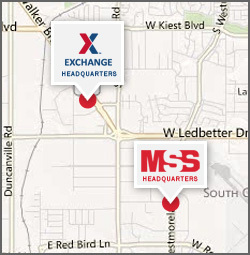 Military Sales & Service HQ office is located less than 1 mile from AAFES HQ. Navy Exchange Command HQ located in Virginia Beach, VA, conducts the buying for Navy Exchange locations worldwide. Military Sales & Service has a satellite office located less than ½ mile from NEXCOM. Marine Corps Exchange HQ, is located in Quantico, Virginia. Coast Guard Exchange HQ is located in Portsmouth, Virginia. Coast Guard Exchanges are also accessible by Transportation Safety Administration personnel. Veteran’s Canteen Service HQ is located in St. Louis, Mo. VCS locations are located within Veteran’s Hospitals nationwide, and offer a wide array of product categories, albeit in a smaller retail footprint. Military Sales & Service Company provides a turn-key outsourced sales and service solution to the entire military retail channel, with personnel located globally to properly support our mission. If you desire more specific demographic or channel information, please feel free to contact us.